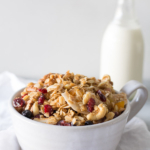 Chewy Nut Loaded Granola is just that. 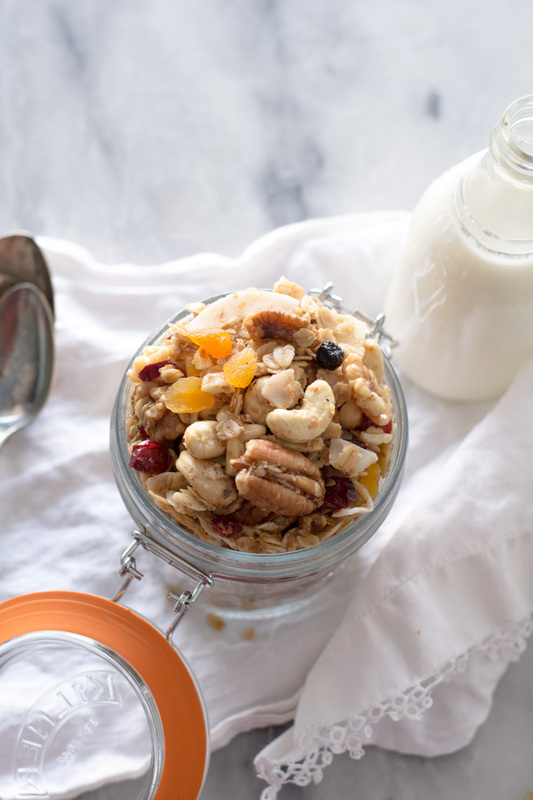 It’s nuts how many nuts are in this granola recipe. 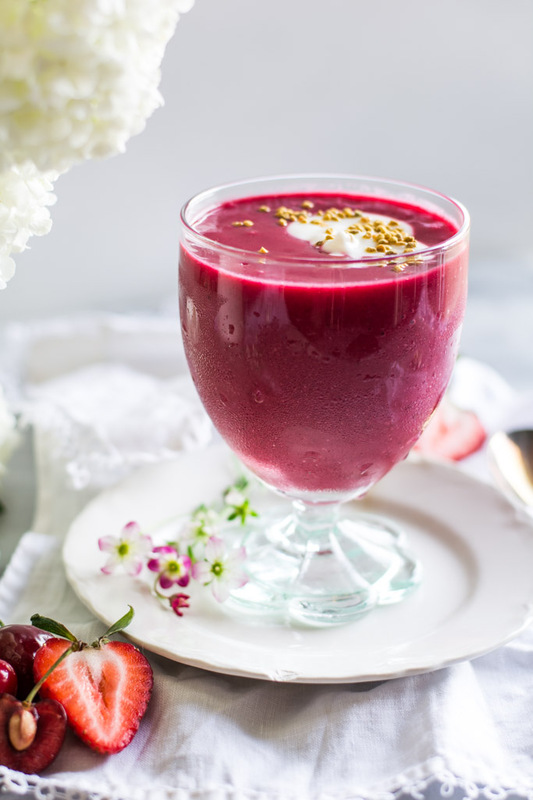 It’s sweetened with honey and maple syrup combined with avocado oil for extra nutrition. 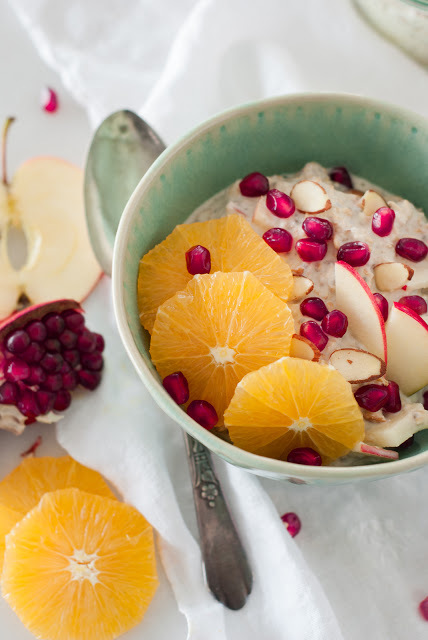 With added dried fruit for more chew and sweetness. Raw nuts are one of the healthiest snacks you can eat. They contain a wide range of essential nutrients. If you’re looking for a nutritious, quick snack, nuts (raw, organic and in moderation) are a near perfect option. For instance: Pecans contain more than 19 vitamins and minerals, and research has shown they may help lower LDL cholesterol and promote healthy arteries. Wow! Nuts Support Heart Health, Lower Diabetes, Metabolic Syndrome Risk. The list goes on. Bottom line all nuts are good for you. The key is moderation. A healthy handful will lead to a good healthy life. So go nuts!! Preheat oven to 325℉. 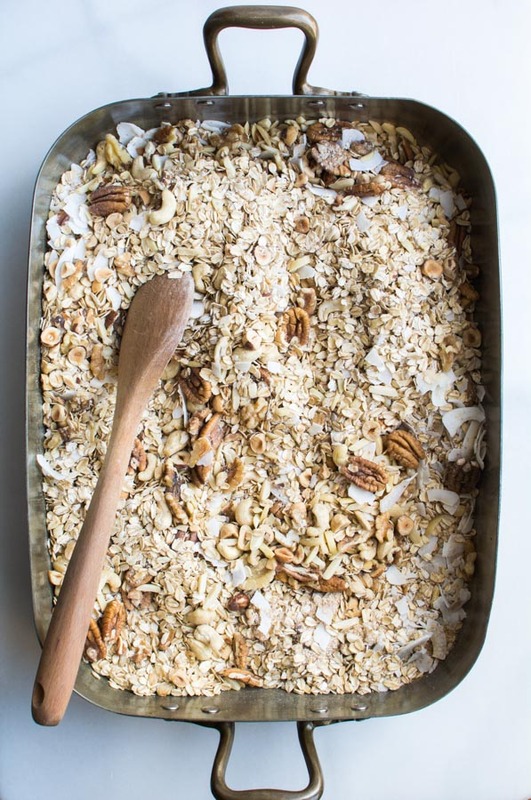 In a roasting pan, add oats, nuts, coconut, and wheat germ. A 9 x 13 pan isn’t large enough, a large baking sheet is too shallow, a roasting pan is just right. Stir the mixture to combine the ingredients evenly. Pour mixture over oats and nuts. Stir well to evenly coat all of the ingredients. Place in preheated oven and stir well every 10 minutes making sure to pull the mixture from the corners into the center because they cook the fastest and will brown too much. Remove from oven and add dried fruits. Stir well. 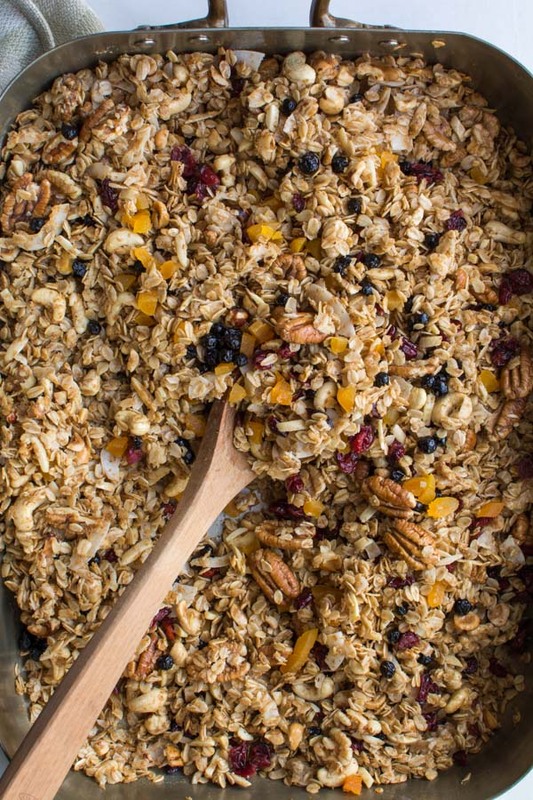 Be sure to eat a handful of the warm granola. It’s heaven. Store in an airtight container or two. 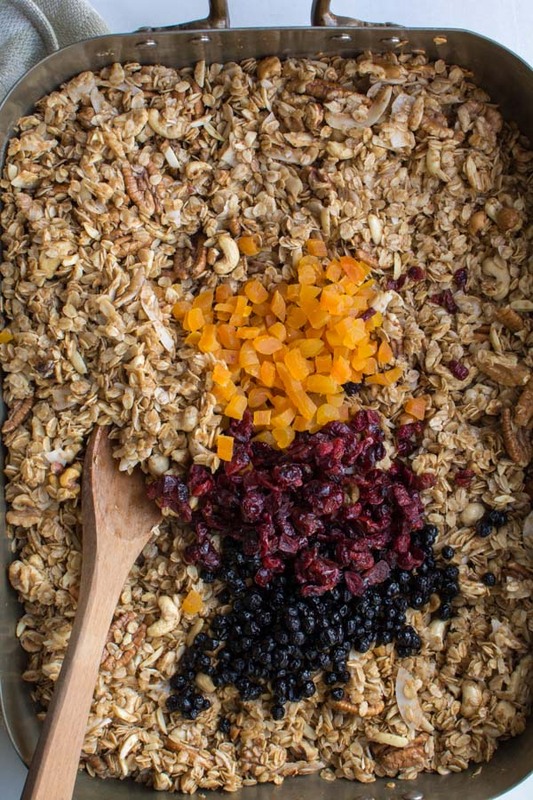 This will make over 2 quarts of granola. Enough to freeze or share. 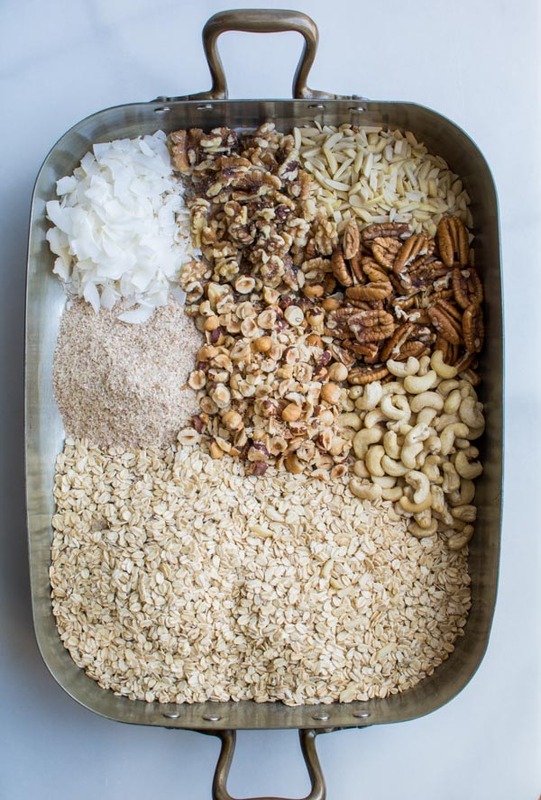 Use 5 cups of any nuts you have on hand or that are your favorite. 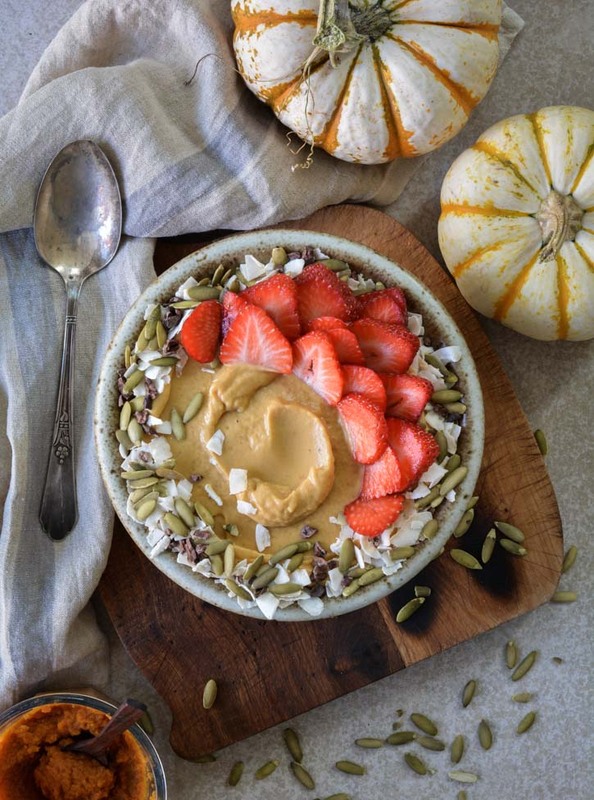 Mix up the nuts with seeds of your choice, like sunflower or pumpkin seeds. Coconut oil is a great substitute for avocado oil. 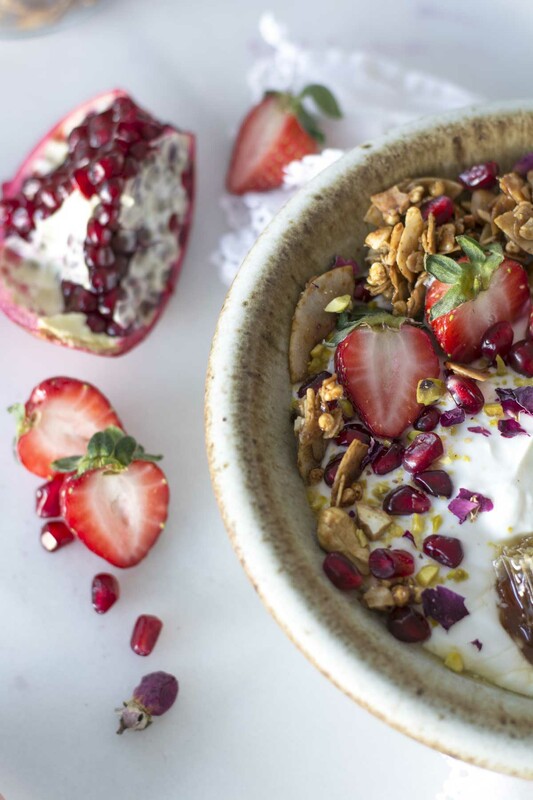 Did you know this granola is Vegan? Using oil over butter keeps it Vegan. Desiccated shredded coconut works just as well as ribbon or flaked coconut. Add spices like cinnamon to change up the flavor. 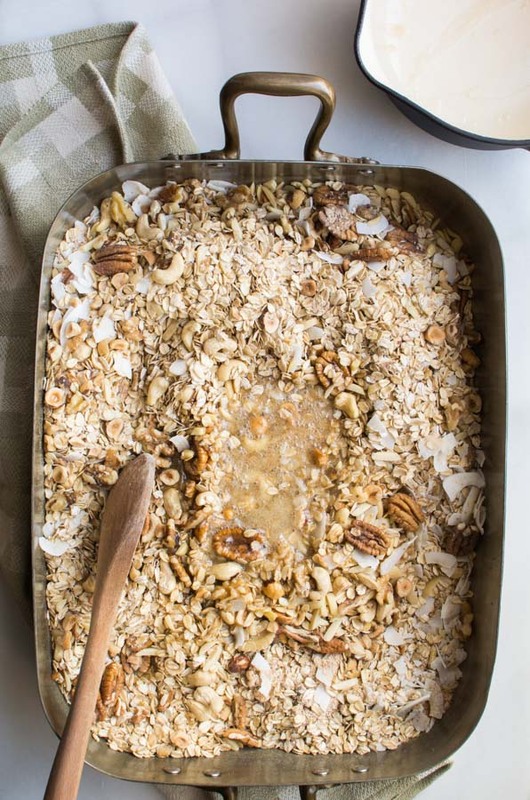 In a large roasting pan mix the oats, nuts, wheat germ, coconut. 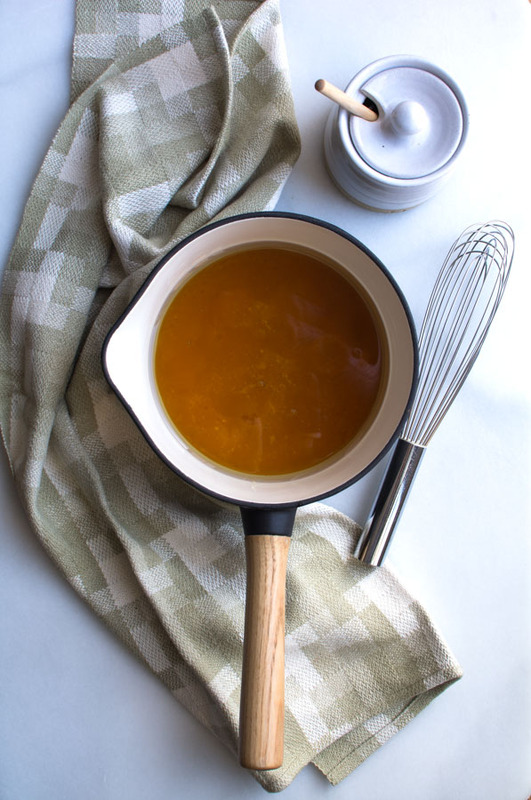 In a medium saucepan heat the oil, honey, maple syrup, and salt until blended and beginning to bubble around the edges. Pour the warm syrup over the oats and nuts. Stir until the oats and nuts and completely coated. Bake in a 325℉ oven for 30 minutes, turning and stirring every 10 minutes. Remove from oven and stir in dried fruit. Store in an airtight container. Can also be frozen. Makes at least 2 quarts or more. A 9 x 13 pan isn’t large enough, a large baking sheet is too shallow, a roasting pan is just right. Stir well every 10 minutes making sure to pull the mixture from the corners into the center because they cook the fastest and will brown too much. Salt is optional but really brings out great flavor. Store in an airtight container or two. This will make over 2 quarts of granola. Enough to freeze or share. I’m so glad to hear that. Thank you so much. You’re the best. 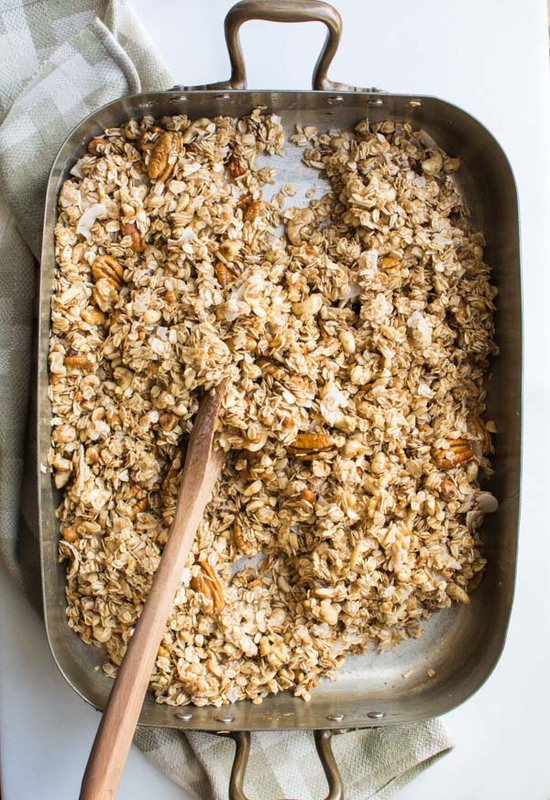 This is my favorite granola and one of the best things you make. 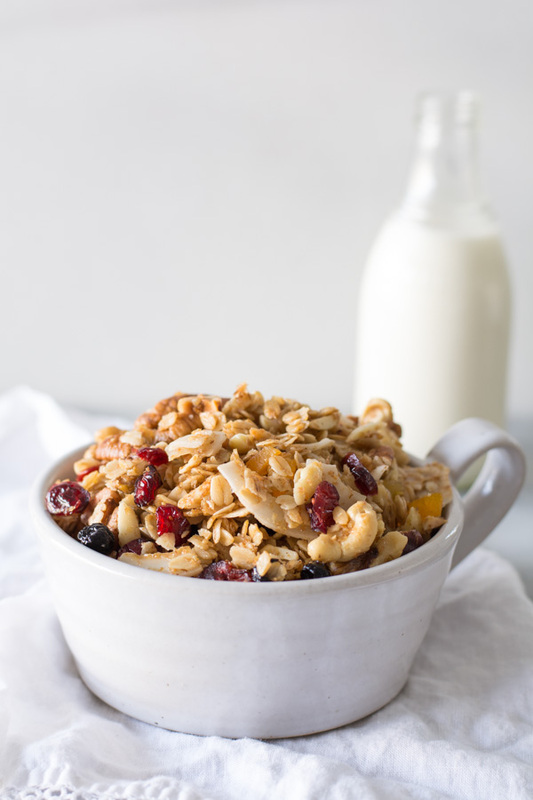 This granola is amazing!!! Best recipe ever!! !